FORT LAUDERDALE, F.L. / September 23, 2014 - Rand Internet Marketing congratulates Noah Hemzacek on winning the Rand Marketing Web Design Scholarship. Noah is an incoming freshman at Arizona State University, majoring in marketing who has expressed an interest in design. 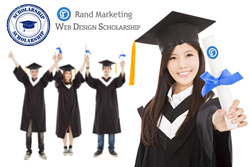 Rand Marketing offered a $1,000 scholarship for a creative submission to one student to assist with pursuing his or her education, demonstrating a passion for web design or graphic design. The scholarship opportunity was opened to both high school seniors and any student enrolled in an undergraduate or graduate degree program by August 1, 2014 at any accredited U.S. college, university or institute. Each applicant was required to submit an essay of 250 words or more describing what inspired the applicant to pursue a career in the graphic design or website design industry; why the applicant chose his or her particular college, university or institute; and, how the applicant expects his or her education to enhance their design creativity and careers goals. Each applicant also had the option to submit his or her original design on Rand Marketing's Facebook page. Rand Internet Marketing, a division of Rand Business Services, offers a full line of design and marketing services including logo design, graphic design, website design, search engine marketing, and social media marketing. Rand specializes in professional responsive web design and development including WordPress websites and Magento e-commerce websites, mobile site design and development, search engine optimization (SEO) and pay per click (PPC) marketing. Rand also offers video production, printing, reviews and reputation management, merchant services and a variety of other professional business services.